Hashirajima. In the afternoon, Vice Admiral (Admiral, posthumously) Nagumo Chuichi's (former CO of YAMASHIRO) First Air Fleet Striking Force ("Kido Butai") CarDiv 1's AKAGI and KAGA and CarDiv 2's HIRYU and SORYU depart the fleet anchorage. Hashirajima. The First Fleet's Main Body consisting of BatDiv 1's YAMATO, NAGATO and MUTSU departs with Supply Group No. 1's oilers NARUTO and TOEI MARU and DesRon 3's light cruiser SENDAI with nine destroyers. Seaplane/submarine tenders CHIYODA and NISSHIN and light carrier HOSHO are in the Main Body's Special Force as reserve under the command of Captain (Vice Admiral, posthumously) Harada Kaku. The Main Body remains 300 miles behind Nagumo's Striking Force. CHIYODA carries eight Type A midget submarines (HA-28, HA-29, HA-31, HA-32, HA-33, HA-34 and two others), about 150 men of the 12th Construction Battalion and 16 crewmen. NISSHIN carries torpedo boats No. 4 and No. 5. The Midway Invasion plan calls for the midget submarines to be stationed at Kure Island about 56 miles WNW of Midway. Lt (j.g.) Otozaka Shoichi, a member of the second midget training course, leads the Kure Island midget submarine unit. At 0430, Nagumo launches a strike against Midway. At 1025, as carriers AKAGI, KAGA and SORYU are preparing to launch strike against American carriers, they are attacked by "Dauntless" SBD dive-bombers from USS ENTERPRISE (CV-6) and YORKTOWN (CV-5) and all are set afire. At about 1035, HIRYU is attacked unsuccessfully by Douglas TBD"Devastator" torpedo bombers of VT-3 from YORKTOWN. At 1054 and 1245, HIRYU launches strikes that heavily damage YORKTOWN. At 1703, while preparing to launch yet another strike, HIRYU suffers hits by four SBD's from ENTERPRISE and YORKTOWN and is set afire. At 1916, SORYU sinks by the stern followed at 1925 by KAGA that also sinks stern first. At 0255, the C-in-C, Combined Fleet, Admiral (Fleet Admiral, posthumously) Yamamoto Isoroku (former CO of AKAGI) sends a signal from flagship YAMATO that cancels the invasion of Midway. Captain Harada receives the signal and orders CHIYODA, NISSHIN and HOSHO to set course westward. 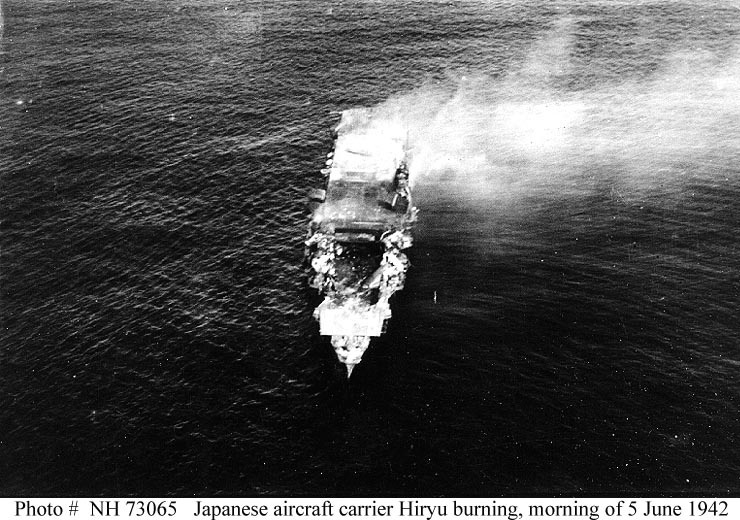 At 0510, HIRYU is scuttled by an IJN destroyer. At 0520, the burning hulk of AKAGI is scuttled by torpedoes from IJN destroyers and sinks bow first. The Main Body joins up with the remnants of the retiring Striking Force. MUTSU takes aboard about one-half of the survivors from AKAGI, KAGA, SORYU and HIRYU picked up earlier by DesRon 10's destroyers. At 0410, a lookout of Cdr Tanabe Yahachi’s I-168’s spots YORKTOWN 12 miles away. For nine hours, Tanabe skillfully makes his approach. At 1331, he fires five torpedoes. Two strike the already damaged YORKTOWN, but she still does not sink. 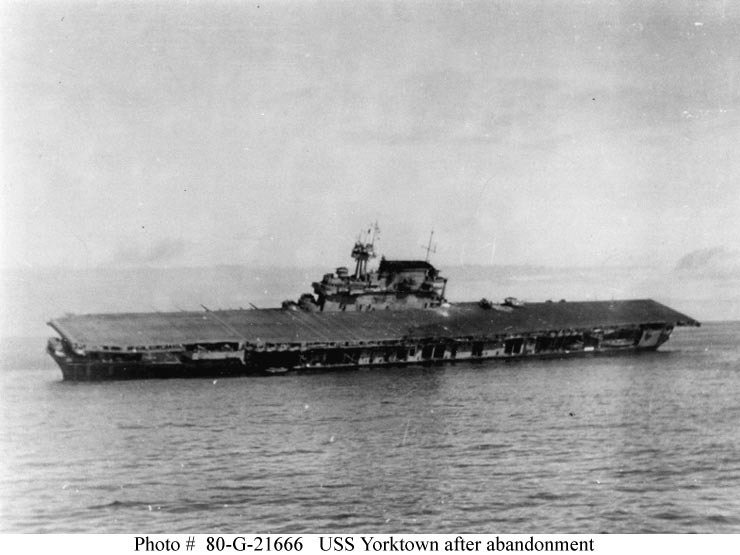 At 0458, YORKTOWN rolls over to port and sinks in about 18,000 feet of water. 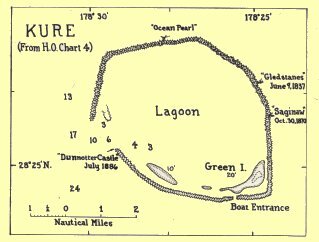 Kure Island, better known as Ocean Island, is about 6 miles in diameter and is the northernmost coral atoll in the world at 28-25N. It lies 1,200 miles NW of Honolulu and is the oldest and westernmost exposure of the Hawaiian Islands chain of volcanoes. Author/historian Kimata Jiro notes the midget submarines' mission was to attack any future US invasion force en route to Midway. Kimata adds the idea to use the midget submarines as a defensive weapon was a complete reversal from their original tactical purpose. CHIYODA later delivers midget submarines HA-28, HA-29, HA-31, HA-32, HA-33 and HA-34 to Kiska, Aleutians.